Born and bred in the rough and tumble New York City bar circuit, New Jersey’s Blues Traveler have come a long way. They were high school students when they first got together playing whatever jam nights they could, but grew into solid musicians and, through a relentless self-promotion campaign, eventually got the attention of A&M Records. An American success story, they were signed and they released an eponymously titled debut album in 1990. Four albums later, Blues Traveler broke into the Top 40 with Run-around, the first single from 1995’s Four, a track that features the incomparable harmonica work and vocals of leader John Popper, and the solid rhythm guitar playing of Chan Kinchla. Run-around is buoyed by Chan Kinchla’s persistent strum part, Rhy. Fig. 1, played on acoustic and electric guitars. This single figure dominates the entire tune and is found behind the intro, verses, cho­ruses, and outro. It is as unflagging as a drum part and is a true example of rhythm guitar. Let’s look at the basics. 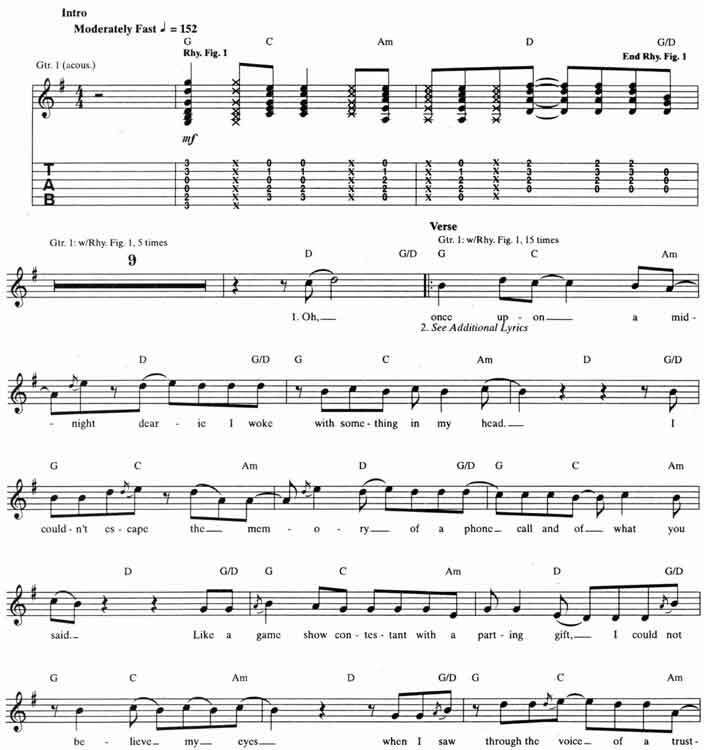 The rhythm part is a strummed, two-measure figure which makes good use of choked (fret-hand muted) chords and emphasizes the offbeats that give it a syncopated feel. Start by strumming upstrokes and downstrokes in eighth notes (eight strums to a measure). Next, choke the strings by lifting off, while retaining the chord shape and maintaining light muted contact on the beats (strums) marked with X’s. These would be beats 2 and 3 of the first measure, and beats 1 and 2 of the second measure [Fig. 1]. Chan’s driving rhythm figure is made of simple open chords in the key of G major. The progression is G (I)-C (IV)-Am (ii)-D (V), a very common harmonic pattern indigenous to folk, country, and pop. When playing these types of progressions, it is advantageous to look for common fingerings and notes shared by the different chords. This will facilitate a smoother, more connected performance. For example, notice fingers 2 and 1 are in the same positions relative to each other (same shape) and fretting the same strings in both the C and Am chords. As you switch, keep those notes fretted while you move your third finger from the 5th to the 3rd string for a minimum of motion in changing chords [Fig. 2]. Similarly, there is a common tone and common finger in the D to G chord change [Fig. 3]. It’s a part of Blues Traveler Run-Around guitar tab and sheet. © 2012 - 2019 TabsClub Powered by TabsClub 42 queries in 0.297 seconds.